Bulk bags are large industrial containers made out of flexible material and are designed to store dry bulk materials like fertilizer, sand, plastic granules, and other flowing products. Most bulk bags can handle up to one ton of material, even though they only weigh 5 – 7 pounds when empty. Thick woven polyethylene or polypropylene material is used to create the bag. This material is lightweight and strong. A coating is sometimes added to the fabric to increase its life. Sometimes bags are filled and moved around on a pallet. When the bag is full, it will stand upright on a pallet without support, and a forklift can easily pick the entire load up and move it. This technique is very convenient when a bulk material handling facility has a bag filling station and new bags are constantly being filled and then shipped. Bulk bags are also made with four strong loops on each corner at the top of the bag. Another way that a full bag can be moved is by sliding these loops onto the forks of a raised forklift. An operator can then pick the whole bag up with the forklift and set it down on the floor or on a pallet. The greatest advantage of using bulk bags in any bulk material handling operation is the cost savings. Rather than having to invest in more expensive rigid containers, industries can use and reuse bags the are relatively inexpensive. Another considerable advantage is the convenience of bulk bags when it comes to unloading. A secure flap at the bottom of the bag can be opened once the bag is hanging over a hopper or bin. Once this flap has been opened, gravity takes over and the contents of the bag flow through the hole to the desired destination. Because bulk bags require the use of a forklift to be moved, workers in a bulk facility avoid the risk of injury due to heavy lifting of smaller containers or bags. These bags are also a convenient tool for shipping bulk contents because they can be set on pallets and easily loaded into the back of a transport truck. Industries like agriculture, landscaping, plastics and more all use bulk bags because they are such a convenient and cost effective material storage solution. Sometimes bulk bags are stored on pallets for long periods of time before they end up being used or emptied into a hopper for transfer to smaller packaging. Over time, the contents of the bag can settle and even lump together, creating flow issues during discharge. A piece of equipment called a bulk bag conditioner is used to deal with this problem. Many bulk bag conditioners are actually built into a bag discharger system. They operate by squeezing the bag from either side with mechanical arms while material is being released from the bottom. The back and forth motion of the arms against the sides of the bag dislodges any compacted material and restores an even flow. The arms of the bag conditioner are powered by hydraulic pressure. Because of this, they can generate a high level of power while still moving slowly and smoothly. Bag conditioners can also be used as an independent piece of equipment placed directly on the floor of a bulk material handling facility. If the bag is moved via forklift and placed on the machine, it takes just a few motions to dislodge the contents and prepare it for discharge. A bag conditioner can be operated using manual or automated controls. An automated system is the natural choice for bulk bag conditioners that are synchronized for use with other equipment like bag dischargers. A manually operated unit is best when the bag conditioner is used independently and the use isn’t necessarily constant. Some bag conditioners even have specially contoured plates attached to the ends of the squeezing arms to hold the bag and push against it at the same time. These plates come in contact with more surface area to dislodge more material in the bag. A number of bulk bag conditioners are built with a rotating pallet platform so that the bag can be turned while it is resting on the machine. This way the contents can be squeezed at intervals from all four sides instead of just two. Bulk bag dischargers, or unloaders, provide efficient discharging of powders or other dry bulk materials from bags that were used to provide storage or easy transport for otherwise difficult-to-handle materials. Bulk bag unloaders are particularly useful in instances where the bags were taken from storage, because materials may have become tightly packed over time and much more difficult to unload manually. Any bulk material handling facility that deals with bulk materials in bags needs a bulk bag discharger on site to unload material efficiently. Frequently used for unloading materials such as polymers, cement, soda ash, magnesium oxide, powders, grains, and hydrated lime, bulk bag unloaders offer dust-free material handling due to their enclosed, tubular design. Not only useful for a variety of materials, bulk bag unloaders can also be used with a wide range of bag sizes and styles including lined, unlined, polypropylene, mesh, wicketed, gusseted, and perforated. At times, bulk bag unloaders may also be used for flexible containers. As a cost-effective and safe means of unloading bulk bags, bulk bag unloaders are often used in industries such as chemical and food processing, construction, commercial, foundry, mining, and pharmaceutical. Bulk bag unloaders are typically a fairly simple construction to which many accessories may be added depending on the requirements of the application. Bulk bag unloaders mainly consist of a frame, a hopper, bag support, typically suspension loops attached to the bags, and an outlet chute. However, there are many different frame configurations for bulk bag unloaders, the most common of which include forklift-style and chain hoist-style. Forklift-style bulk bag unloaders have pockets that allow for a forklift to easily load bulk bags into the bulk bag unloader. This type of bulk bag unloader is generally shorter than a chain hoist-style bulk bag unloader because it eliminates upper framework necessary to lift or position the bags. 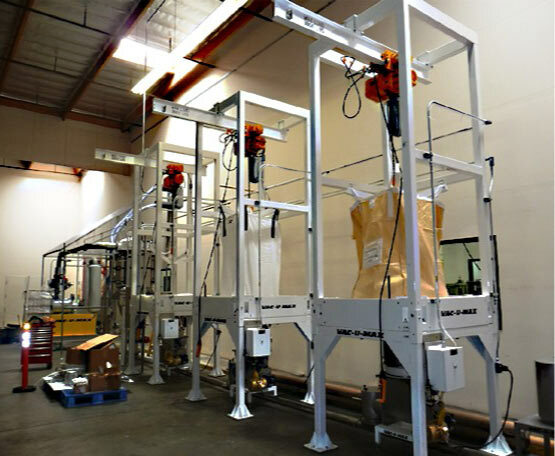 A chain hoist-style bulk bag unloader enables loading of the bags without a fork lift, integrating a pneumatic or electrically powered hoist that allows an operator to lift, position, and support the bag for loading. A less common style of bulk bag unloader is crane-style. A crane-style bulk bag unloader uses a crane in much the same way that a forklift would be operated to load bulk bags. All styles of bulk bag unloaders allow for efficient material discharge for further processing or a longer term mode of storage. 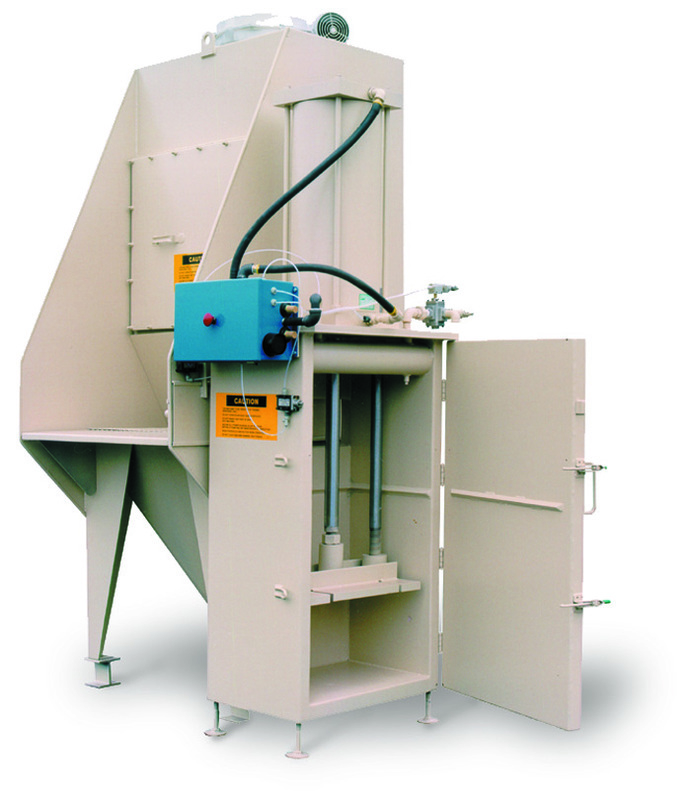 A bulk bag filler is a piece of equipment used to hold empty bulk bags securely in place while they are filled with material. Manufacturers create several different types of bulk bag fillers, but they all achieve the same function in more or less the same manner. A steel frame with a platform houses the empty bag, and material is loaded into the bag from a filling hopper or pneumatic conveying system. Some bulk bag fillers hold the empty bag upright in a vertical position at its full height while the material is loaded directly from a chute and the bag slowly begins to fill. Once the bag is full, it can be removed from the machine using a forklift that either lifts the pallet below the bag or lifts the bag using the heavy duty loops on top. For bulk material settings where abrasive or delicate material particles are being handled, another type of bulk bag filler is used. 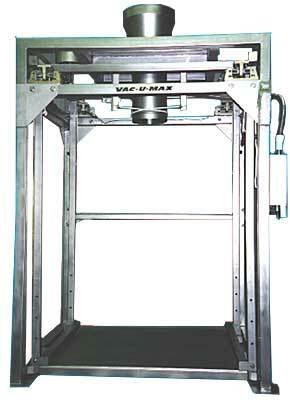 On this type of bag filler, a single post extends upwards from the base of the machine, and the filling unit travels up and down this post. The bag loops are attached to the unit, and the bag is gradually pulled up as it is being filled. This method reduces the distance that the bulk material has to drop into the bag, resulting in a much gentler material transfer. Bulk bag fillers with dust control can also be purchased to minimize the dust created in a facility during material transfer. Some units have a sealable valve that transfers the material from the chute to the bag without ever exposing it to the air outside. For sanitary needs, bulk bag fillers can be made from stainless steel for easy cleaning and resistance to corrosion. There are many variations of bulk bag filling machines, and sometimes manufacturers must construct them for very specific industrial applications using a set of specifications from the customer. Bag fillers increase efficiency in a bulk material operation and provide operators with a simple and clean way to transfer material for shipping or storage. Bulk Bags Bulk bags are large industrial containers made out of flexible material and are designed to store dry bulk materials like fertilizer, sand, plastic granules, and other flowing products. Most bulk bags can handle up to one ton of material, even though they only weigh 5 - 7 pounds when empty.